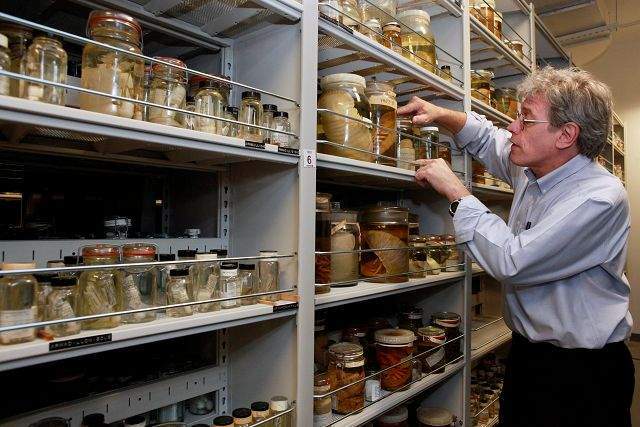 Jonathan Coddington, associate director for research and collections at the National Museum of Natural History, looks through the invertebrate specimens at the Smithsonian Museum Support Center, in Suitland, Md. The museum complex holds a complete set of the invertebrate species that live in the Gulf of Mexico. SUITLAND, Md.  Scientists studying the massive BP oil spill are turning to a vast collection of preserved animals at the Smithsonian to see what kind of changes the oil spill may wreak among life forms in the Gulf of Mexico. The museum and research complex in Washington holds the most complete set of invertebrate species from the Gulf, offering scientists studying the spills effects a look at life before the gusher began. A researcher pulling a creature from the Gulf can use the Smithsonians collection to compare its size, body chemistry and other characteristics to a specimen collected before the catastrophe. Smithsonian scientists began putting their collection to use just days after the oil spill, creating a digital map showing where each specimen was collected in the Gulf. Information from the collection could help settle conflicts about how much damage the spill caused, said Jonathan Coddington, head of research and collections at the National Museum of Natural History. Requests for loans of specimens and other information about the Gulf creatures have spiked since the April 20 explosion on a drilling rig leased by BP PLC unleashed the spill, said collections manager Cheryl Bright. It also has increased the urgency of efforts to catalog tens of thousands of specimens from the Gulf. The collection includes more than 333,000 cataloged containers of invertebrates collected in the Gulf by the U.S. Minerals Management Service during the last 30 years. Another 39,000 jars are partially inventoried, though as many as 120,000 more havent been inventoried at all. The MMS, which recently changed its name to the Bureau of Ocean Energy Management, Regulation and Enforcement, is considering transferring hundreds of thousands of dollars to the Smithsonian to help speed up the process, Coddington said. Last month, Coddington described the backlog to a House panel and told them it would cost $9 million to finish the inventory of all Gulf specimens. He said in an interview the government has a responsibility to pay for the work. Its not a silver bullet for understanding the impact of the oil spill. But its a chunk of one, he said. The MMS conducted environmental surveys of the waters for years, specifically to help predict the impact of future gas and oil explorations. They began turning over the extensive collection to the Smithsonian for cataloging and safekeeping in 1979. Biodiversity scientist Tom Shirley at Texas A&Ms Harte Research Institute for Gulf of Mexico Studies said the Smithsonian serves as a repository for the worlds ecosystems because its collection is so large. As research funding and projects ramp up, he said, many samples will be pulled from the Gulf that will be unfamiliar species. Shirley said one of his former students, Peter Etnoyer, is on a National Oceanic and Atmospheric Administration cruise in the Gulf to study deep-sea corals after the oil spill. Etnoyers research draws extensively on on the Smithsonians coral collection. Still, scientists cant rely on the Smithsonian alone for a picture of the Gulf before the spill, said Monty Graham of the Dauphin Island Sea Lab in Alabama. Marine centers in the region also have vast data on variations in plankton and other sea life from the days and years before the spill, for example.